In military parlance, a Common Operating Picture (or “COP”) is a single presentation of the battlespace to a wide and distributed audience. The purpose is to provide common understanding and situational awareness for all involved. I’ve adapted this idea to graphically display the “battlespace” a leader has to understand so the team can achieve success. Leaders must harmonize the needs of their organization, their task, and individual team members to prevail. It’s a complex and people-focused job. If a leader can find the sweet spot in the “Leadership COP”, then they’re truly leading teams to high performance. Organizations have needs: financial, social, etc. These organizational needs are often expressed in company values and policies, but they don’t have to be explicit to be part of the leadership environment. Social pressures for corporate responsibility or the need to become or remain a “pillar of the community” can be powerful needs even of unspoken. Regardless of whether these needs are expressed in writing or merely just “understood,” they are the boundaries for organizational behavior. These boundaries will mean some solutions will simply be “off the table,” and behaviors acceptable in one community could be unacceptable in another one. In order to get the team within the “organizational needs circle,” and move that circle to the sweet spot, leaders can use a variety of techniques. Teams must adopt shared values, otherwise they’re just a mob who happen to be moving in the same direction. Written policies on standards of behavior, and PowerPoint presentations on the company mission statement will only go so far. Leaders have to set the example and guide the team to accept those organizational values. It will do no good for the mission statement to be on the wall if it’s a joke to the team. Leaders have no right to expect behavior of their teams they’re unwilling to model themselves. Leaders hit the sweet spot when they motivate their team to take on the organizational values as their own. “Task needs” are usually immediate and tangible concerns like time, dollars, and space, and of course are focused on customer’s requirements. A word of caution here: don’t assume everyone understands the goal. Leaders bear the responsibility of assigning work and parsing tasks, but if the team members are working only on their part without understanding the whole, the team is headed for disaster. 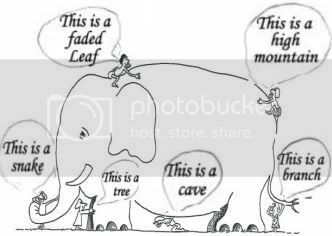 Like the old story of the three blind men describing an elephant, each member of the team needs to understand the whole and not be so focused on the parts they miss the point. The sweet spot is when the tasks the team are working on are aligned with both the short term goals and the organizational mission. So what can leaders do? Understanding the task at hand and then executing requires planning, communication, and follow up. No job “just happens,” so a thorough plan is vital to success. That plan can’t merely remain written down on a pad in the boss’ office or in her head, it has to be communicated. A good plan will answer the “Five W’s” (Who, What, When, Why, Where) and ideally be assembled with the participation of the team that has to execute it. Military units do thorough mission briefs in a standardized format, readily understood by the team. It’s an effective way to ensure everyone is operating from the same starting point and with the same information before the mission begins. Any organization can employ the same technique effectively. It’s easy to simply focus on the mission and the task at hand and ignore the needs of the employees, but that’s a mistake. There are common needs every person has like the need for affirmation, meaningful work, or achievement. There are also needs specific to each person like need for companionship or to express creativity. Understanding the needs of people on the team and then responding to them is a key component of good leadership. It’s more than merely making sure an individual’s talent is used effectively. It’s a two part job: leaders have to not only know their people, they have to actually engage in the work of trying to harmonize employees’ personal needs with the needs of the organization and the mission. A leader must spend time getting to know his people on a personal level. Note that “getting to know them” doesn’t necessarily mean being their buddy. It’s rarely a good idea for the boss to be a “buddy,” the boss is the boss and needs to maintain a professional distance. It doesn’t mean the boss know enough about his or her team to understand people’s internal motivations. Perhaps this person thrives working on solo projects, or that one likes supporting roles but wants recognition. Leaders must spend time getting to know their team well enough to see them as the complex persons they are, rather than as cogs in the machine. Doing the work of understanding each individual’s motivations will pay huge dividends when it’s crunch time. Harmonizing the needs of the organization, task, and individuals is the most important job of a leader. It takes skill to plan a mission, but it takes leaders to inspire and motivate a team to get than mission done. 1. Identify your organizational mission. What are you trying to accomplish? 2. Get to know something about what motivates your employees. Why do they do what they do?